Door County Houseboat Rentals has a one-of-a-kind lodging experience awaiting you on the edge of the Sturgeon Bay canal in beautiful Door County, WI. 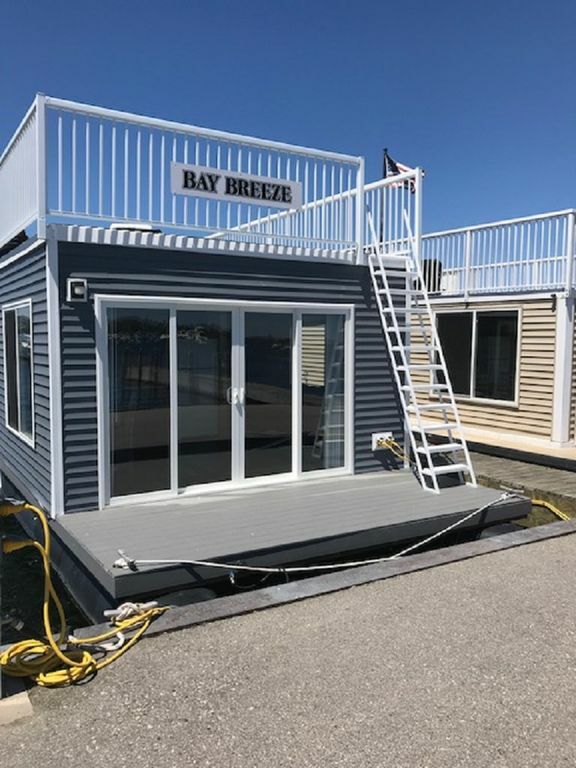 Bay Breeze, a floating cottage features all the comforts of a home with sleeping accommodations for up to 6 people. The Galley amenities include: refrigerator, microwave, toaster, flatware & dishes, pots & pans, coffee maker & induction cook-top, as well as outdoor gas grills on-site to grill up the day’s catch. The on-board bathroom has a vanity, toilet & stand-up shower (additional bathhouse & coin operated laundry facilities are available on-site as well). The two bedrooms on-board offer a queen size bed in one & a set of bunk beds in the other, as well as a pull out queen size bed in the sleep sofa. The upper deck features ample space & 6 Adirondack chair to enjoy the beautiful sunrises & sunsets. Your rental also includes use of the Community Center (which contains a heated salt water pool, a wrap around sundeck, a clubhouse with a kitchenette, television & wi-fi service and a pickle ball court), as well as the Pavilion Area with picnic tables, gas grills and an open air fire pit! Feel like taking in the Sturgeon Bay shoreline from the water during your stay? Inquire about renting on of our run-about boats, kayaks or stand up paddle boards. Items supplied for your use in the Floating Cottage: garbage bags, broom & dustpan, toilet paper, paper towels, dish towels & soap. Items you may want to bring along: bedding or sleeping bags, pillows, bath towels, paper products (napkins, paper plates, etc. ), bathroom & personal items, sunscreen & insect repellent, cell phone & chargers, flashlights, games for rainy days, etc. There are additional bathroom facilities located on-site as well with additional showers, toilets, sinks & hair dryers. Includes a treadmill and stationary bicycle. Kayaks & stand-up paddle boards available to rent on-site. My sisters, best friend and I had a great time. Despite struggles with the A/C not working, the staff went above and beyond to resolve the issue. Both Jeremy and Kristen assisted with moving our stuff. Jeremy seemed to always be around to save the day from zip tying the key so it didn't get lost to securing the boat so my sister with MS can get on and off with ease. Both Autumn and Kristen responded timely to minor problems that first time boat renters had no clue how to fix. Everyone was very nice and helpful. We loved every minute and interaction during our stay.